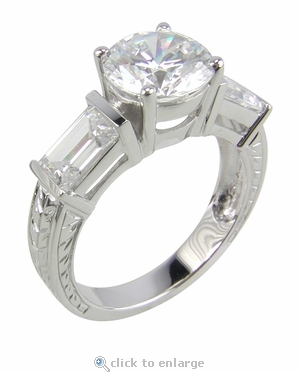 The Adella 2 Carat Round Cubic Zirconia Baguette Engraved Solitaire Engagement Ring features a 2 carat round 8mm cubic zirconia center stone with .75 carat 6x4mm emerald radiant cut cubic zirconia on each side for a total carat weight of 3.5 carats. The shank includes beautiful engraved detailing on all three sides and measures approximately 4mm at the widest point. 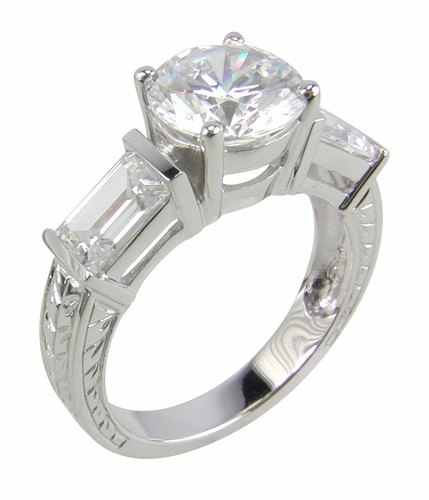 The basket set cubic zirconia center stone is hand cut and hand polished to exact diamond specifications and includes a lifetime warranty against cracking, chipping, fading or losing brilliance. Our bands section features a variety of wedding bands to compliment this engagement ring in all the up to date styles and designs. This is a clearance item and is a Final Sale.